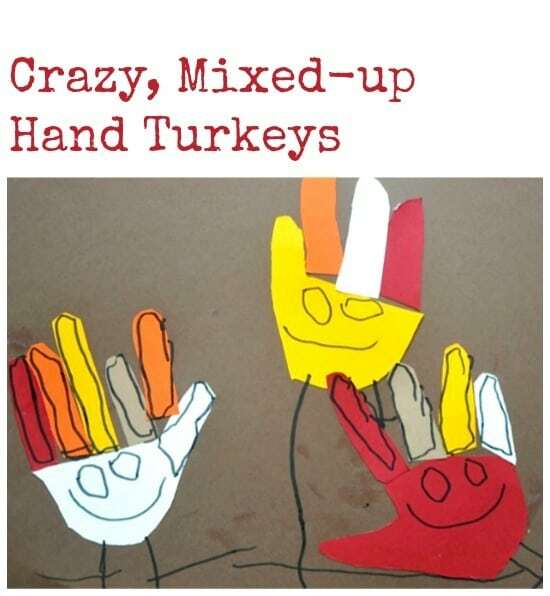 Hand turkeys are the ultimate Thanksgiving craft, and one I am quite fond of. 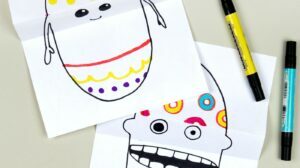 Little kids just don’t get tired of tracing their hands and making cool things out of them. Each of these steps can be done with varying amounts of help from your wee ones depending on their ages/abilities. 1. Trace lots of little hands on Fall colors of colored card stock. 3. 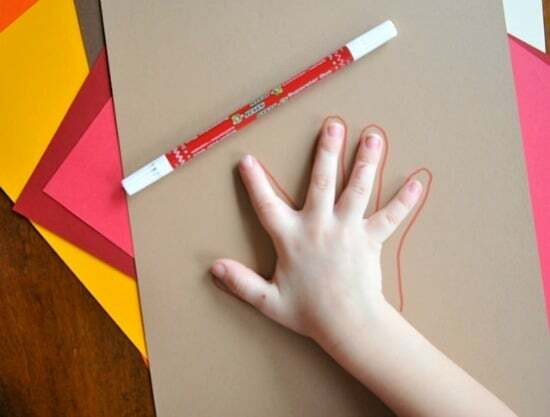 Glue the palm parts of the hands on a piece of colored card stock- as many as you want, wherever you want. 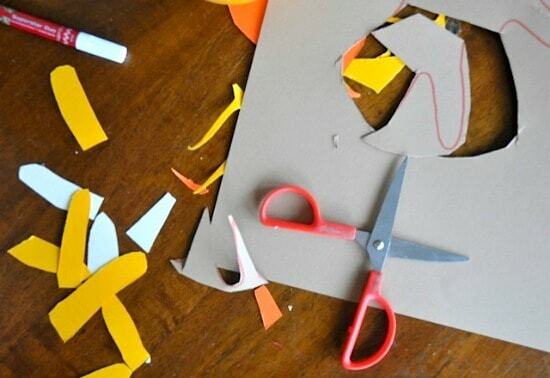 Make a cool design or make a turkey family. 4. Glue on fingers of varying colors to be the feathers. We didn’t ad the waddles because they make me queasy. 5. Draw on turkey faces, a barnyard scene, a turkey disco, turkeys in space, what have you. 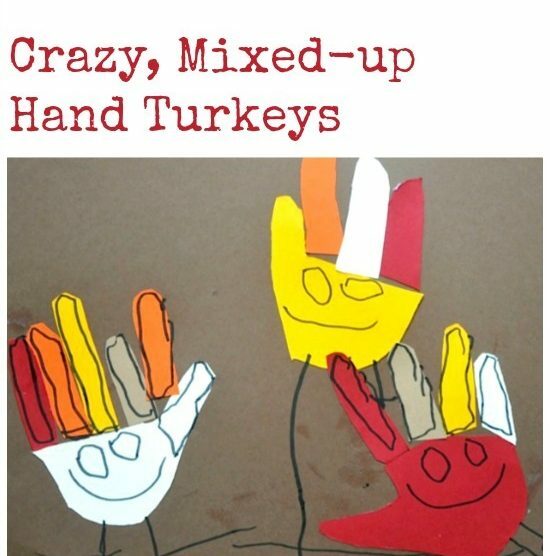 This is where it got cute for us- I took for granted that Beckett was going to be able to see the turkey shape in the hands, but when I said he could draw faces on the turkeys, he drew them right on the bodies. Awwww. I think Beckett’s idea was outstanding! Love these and my youngest will love trying it too. Thanks for putting a new twist on an old favorite. 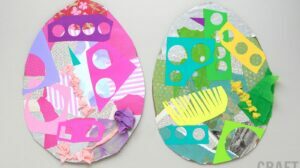 I’m so happy your child will enjoy these- we had a lot of fun with them! 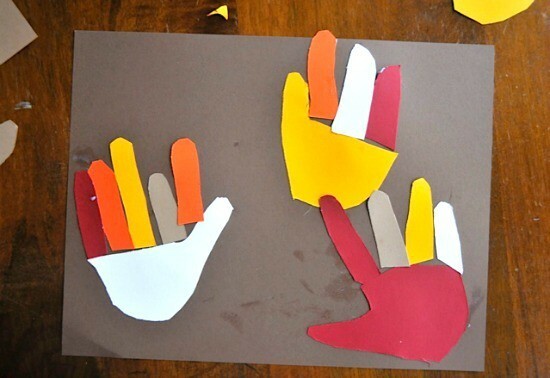 Hands down, this is the best turkey handprint craft. EVER. YES!!!! 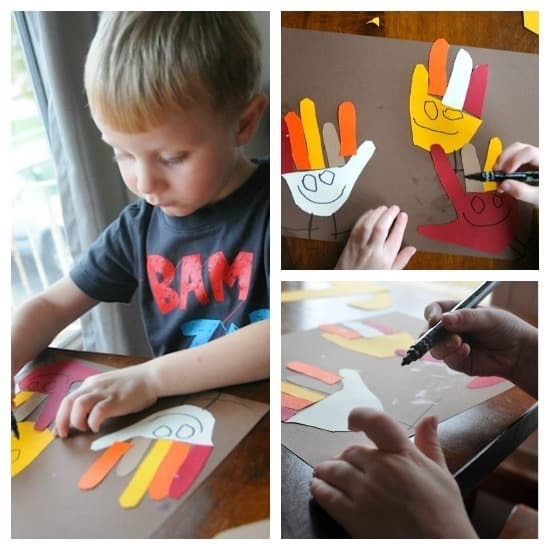 You mean we beat out all of those other turkey handprint crafts? I feel like we should be getting an award or something. Awww is right. These are so sweet. Thank you Aruna! It will stay up on our fridge for a while. Luuuuurve 😉 These are too adorable for words. Not gruesome at all, LOL! ADORABLE!! 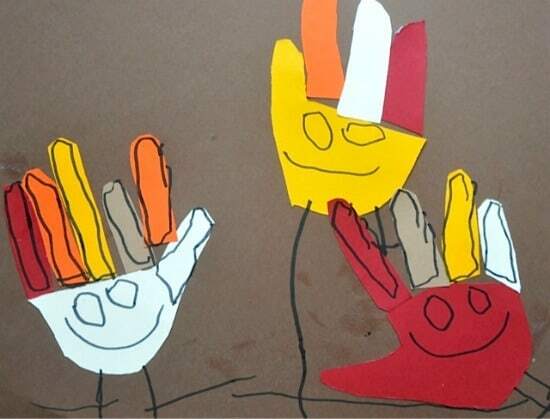 I love the turkey’s happy expressions! I think Beckett has your artistic talent!! If there was ever a turkey disco, I’d be there. How adorable!! The faces on the turkey’s just draw you right in and make you smile 🙂 Thank you for linking up and sharing this week on the Thoughtful Spot Weekly Blog Hop! This is a great idea! Love them! Of course- But please link back to my original post. Thanks!